Neuhaus am Rennweg – The Röchling Group is investing €35 million in its Neuhaus am Rennweg plant, creating some 70 new jobs. This will enable a significant expansion in the production capacities of Röchling-HPT Hochwertige Pharmatechnik GmbH & Co. KG, giving a considerable boost to the market position of the specialist in the manufacture of primary packaging for the pharmaceutical and diagnostic industry. 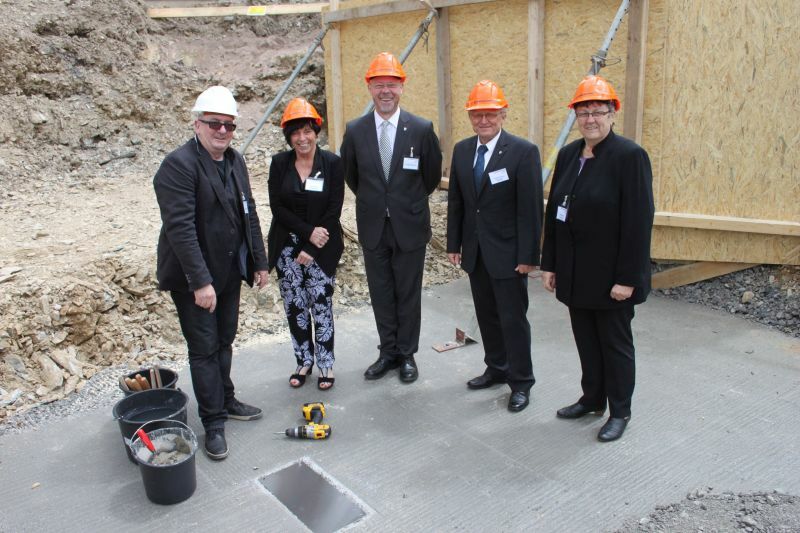 The ground-breaking ceremony was held on Wednesday in the presence of Marianne Reichelt, Mayor of Neuhaus am Rennweg, and Christine Zitzmann, District Administrator of Sonneberg rural district council. In making this investment, the international Röchling Group, to which HPT has belonged since the beginning of 2015, is continuing its strategic expansion in pharmaceutical and medical technology and safeguarding long-term growth at the site in Thuringia. Ludger Bartels, CEO of the Röchling Group, said: "The expansion will enable Röchling-HPT to be a strategic partner for integrated packaging systems. HPT already enjoys great success supplying its customers with a broad range of bottles and containers. In future we will be able to offer complete systems from the bottle through the closure to the administration device." The Managing Director of Röchling-HPT, Karl-Heinz Sladek, added: "Our business volumes have grown constantly over the last few years. The planned investment will allow us to broaden business relations with our customers. That in turn will enable us to ensure the sustainable, long-term growth of the company in Neuhaus and create some 70 additional jobs." The investment is planned in three phases, the first beginning with the expansion of the existing production building. That will create space for the products of the new injection moulding and assembly facility for closures and administration devices in the GMP class C clean room. The existing extrusion blow moulding line in the GMP class D/C clean room will also be expanded. Clean room is the name given to a closed production area in which the concentrations of particles and microorganisms in the air are controlled. The controlled environment makes it possible to manufacture pharmaceutical primary packaging systems and medical devices meeting the most stringent requirements on purity and quality. Methods of controlling the number of particles include, for instance, extensive ventilation and filter systems, specially directed air flows, structural elements such as air showers and special clean room work clothing. A new four-storey office building with social wing will be built in 2019. The production of closures and administration devices will be expanded with the addition of several injection moulding machines, automatic assembly systems and extrusion blow moulding lines. A further increase in production capacities for closures and administration devices and an expansion of the office building are planned by 2023. Some 30 additional jobs will have been created by the end of the first investment phase in mid-2018. The first ten employees for these new positions have already been recruited and undergone an intensive training programme. A further 40 jobs will be created successively from 2019, giving Röchling-HPT a total workforce of around 350 in Neuhaus in 2023. After the first investment phase the focus of requirements will shift to machine operators and manual workers for packaging. The new staff will be given training in their responsible activities in a broad-based programme delivered in the specially designed training centre. To enable the planned increase in capacity to be achieved, highly qualified specialists and managers will also be required in the product development, production, sales and quality assurance departments. This investment is a significant element in the strategy of the Röchling Group to deliver consistent further expansion in the Medical division, created at the start of the year, to which Röchling-HPT belongs. Numbering three companies - Röchling-HPT, Röchling Oertl Kunststofftechnik, Brensbach/Germany and Röchling Advent Tool & Mold, Rochester (NY)/USA - Röchling's Medical division offers a comprehensive range of products and services for injection-moulded components and primary packaging that meet the highest requirements on pharmaceutical hygiene, reliability and application safety. The products are employed in devices and instruments used in surgery, pharmaceuticals, diagnostics and dialysis. Röchling will continue to expand the strategic Medical division strongly through both organic growth and targeted acquisitions.